Lately I've been topping my oats with half an apple, half a banana, dried cranberries, a little bit of granola, homemade maple syrup, and a splash of cold vanilla almond milk - it's so good!!!! The crunch of the apple and granola, combined with the sweetness of the banana, dried cranberries, and maple syrup... it's amazing. The absolute game changer here through is the almond milk. It adds such a creaminess to the oats, and you need to try it!! 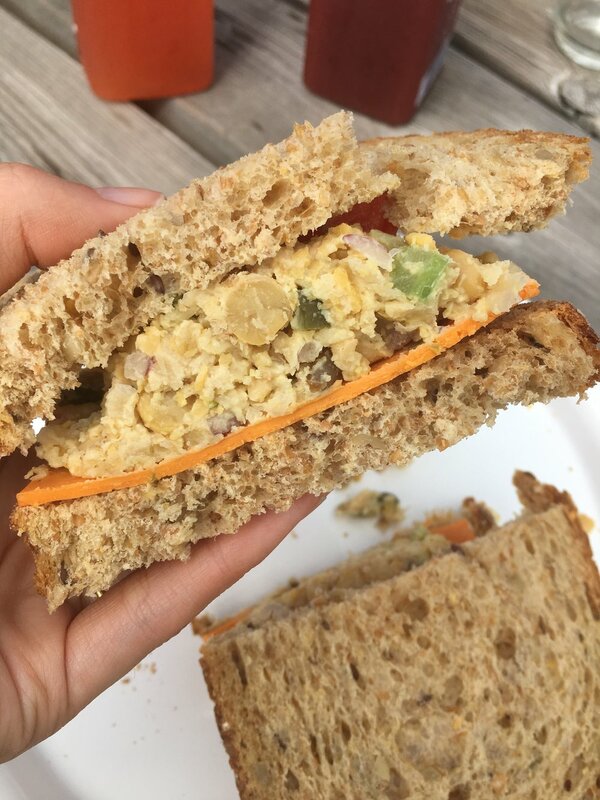 Lunch varies, but lately I've been loving to chickpea tuna sandwiches (and I've gotten at least 4 other people addicted to it as well!). I've mentioned this before, but weirdly enough tuna-salad sandwiches used to be my favourite - so who knows why I've waited this long to try to make it! I used Bonny Rebecca's recipe, and it's literally the best thing I could have ever imagined. I usually have it on multigrain bread with tomato, but the other day at the cottage I had it with a slice of jalapeño cheddar cheese and it was delicious. Remember how I said I liked consistency and routine? I've been eating summer rolls at least once a week for the past two months - they're just so easy and so good! I usually make mine with cucumber, carrots, red pepper, and green onion - and if I'm feeling extra fancy I'll add spinach and baked tofu. It feels silly giving instructions, because they're so easy to make! First I cup up the green onions, and julienne all the other vegetables so that everything is ready to go. Then I fill up a pan with hot tap water, and soak two rice paper rolls for about 30 seconds. Once they're soft I put them on two separate plates and leave them to stand until they're mostly dry and feel a little sticky (about another 30 seconds). Finally I fill them with the tofu and vegetables, and roll them up! Probably the BEST part of this meal is the dipping sauce, it's seriously game changing. Invented by my friend, it's about a tablespoon of crunchy peanut butter and water, and two tablespoons of sriracha and soy sauce.... and it's so good!!! I want to put it on EVERYTHING.